comments: why does my arm always seem to bend on the down swing using the pw.no other club but the pitching wedge. Kim Brown: Sounds like you may take the club back more upright with the wedge. That is a natural tendency with the shorter clubs . That is ok unless you are using too much “hands” to achieve this upright path. If you are using your hands to break the club straight up more, then you will also tend to “break down” on the down swing. You may be feeling that you need to “dig” the ball up into the air, which will cause us to overuse the hands and the resulting left arm break down. comments: I currently play with a standard set of off the shelf clubs. I am 6feet 2 inches tall. I would like to know if having a tailored set of clubs could improve my game. 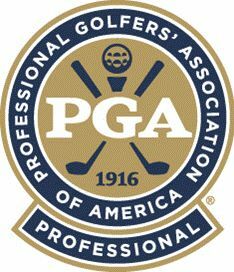 At the normal address position I feel that the sole of the club is not parallel to the ground. Also with having longer fingers than average, should I consider thicker grips ? Kim Brown: Your height may not necessarily require longer clubs, it depends on how far your fingertips are from the ground (in other words, it is the length of your arms compared to the length of your torso). However, if the club does not appear to be flat on the ground, they may be too flat for you. The longer grips and having the lie you need measured is more important than what type of club you play, to be frank. The fact that your clubs are too flat may indicate that you hit a lot of “toe deep” type iron shots which would result in a lot of shots going off line and shorter than possible. I would have yourself measured immediately. Not sure how available “dynamic fitting” is in London, but that involves not only measuring your lie while you are at your address position, but also taking into account your lie at impact when swinging the club through the use of a “lie board”. I would highly recommend the process. comments: I would like to know how to figure out my handicap. I play the new computer game Links LS by Access Software and the courses they have provide the handicap for the holes but I don’t know what they mean. Kim Brown: If you are a 12 handicap, for example, you would apply one stroke of handicap for the holes marked 1-12 on the scorecard. In a net tournament, you would get a “dot” on each of those holes. A dot means that if you actually made a 6 on the hole, you would receive a net score of 5 on that hole. You get no strokes of handicap on the holes labeled 13-18. Handicap hole #1 is the hardest hole and #18 is the easiest. Your handicap itself is figured by taking the low 10 scores from your last 20 posted, averaging, deducting the course rating, and then multiplying times . (point) 96.
comments: I am 49 years old and sometimes when I play in cooler temperatures I tend to stiffen up and swing poorly. I don’t play well with bulky clothing either. I wondered of there is any suggestions for keeping limber of should I just fo to a shortened swing when the temp changes. Kim Brown: Me too. No secret to it other than doing some good stretching exercises, the hitting some balls, either walk when you play or ride in an enclosed cart. Wear “layers” instead of bulky clothes. Wear a sweater vest, as that provides an extra layer without restricting the arms and shoulders. Eat right, exercise, and all that stuff and that is about the best you can do. good luck! Kim Brown: WE should always strike the ball first but we should “FEEL” more like we are sweeping those irons. comments: I’ve been playing for approx. three years and am somewhat satisfied with the improvement I have been making over that time. My most consistent problem is the driver off the tee. For the most part, I often try to compensate for whatever went wrong on the last tee and then I come up with another problem. Could you please briefly run down the basic practice points which I should be using at the range in order to straighten out my drives. Kim Brown: I will provide you one main goal to work towards achieving. Develop a “vanilla shot”. This is the shot you can always go to when in doubt. Either it will tend to be a natural draw or fade. Whenever you play, decide on a given day whether you are going to fade or draw off the tee and stick to it no matter what. We want every tee shot to either go straight OR in that other particular shot pattern of fade or draw. Most of us get in trouble because we don’t know what to expect. Having that “go to” shot will take some work on your part, but you yourself know right now which it is. We get in trouble trying to accomplish more than our swing will naturally provide. You would be suprised how well you can score hitting an “ugly heeler” off the tee all day, for example. Good luck. If you hit your irons better, practice by alternating shots between a 3 iron, then a driver, a 3 iron then a driver, etc. to build more positive swing traits. comments: I’m not a “GREAT GOLFER” but I’m OK. I’m using a set of junk clubs and think I’d play better with a better set of clubs. In the past I’ve not played alot of golf but now I’m starting to play 2-3 a week. I’ve got the money to buy a good set but I’ve been told that I should get a set made. I’ve got a swing speed of 117 with my driver, but when it comes to the irons it’s alot slower (probably because they’re too short for me). Question I have. Should I buy a good set of clubs or get a set made. Thanks in advance. Kim Brown: Buy a good set. You can be custom fitted with good clubs just as easily as you can with clones. comments: I’m shanking my short irons (within 120 yds from green). I know I’m not following thru, but I must have some mental block. Do you have any tips or suggestions to aleviate this problem? Kim Brown: I want you to go to the range, line up 25 balls, and line the ball up on the hosel of the club. I want you to intentionally shank all 25 of them. By the time you get to the last ball, I would bet you “can’t ” shank it. After that, do practice drills where you do practice swings and “hold” the finish position for 3 seconds. Eventually, work the ball into the equation and continue to hold the finish. comments: I hit the ball very straight but am constantly topping the ball both off the tee and with my fairway irons, what would you suggest to cure this problem? Kim Brown: Sounds like your hands are doing most of the work on the downswing. Try taking a bigger shoulder turn, uncoiling the body first on the downswing. Feel like your left arm stays the same length until after impact. and swing to a full finish. 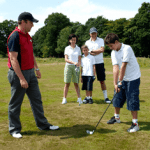 comments: I am a beginning golfer and I have had the hardest time with my downswing. I know I must shift the weight, but how? What are the legs, knees, arms, shoulders, and club supposed to do exactly? I have had pros tell me to get my belly pointing at the target, but I’m not sure how to do this efficiently. Thanks. comments: How do you hit a draw being a right handed player? Kim Brown: Full shoulder turn, keep elbows close together throughout the swing, but in particular at impact. Make sure your shoulders are not “open” or pointed to the left at address. comments: I have a question regarding the weight of golf clubs? Is there a limit to the head weight of the clubs,can we add weight? Is there a PGA rule on this? 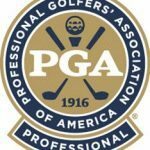 Kim Brown: PGA does not make rules about clubs. You might look in the USGA web site. I don’t believe thereis a limit on the weight of a clubhead.